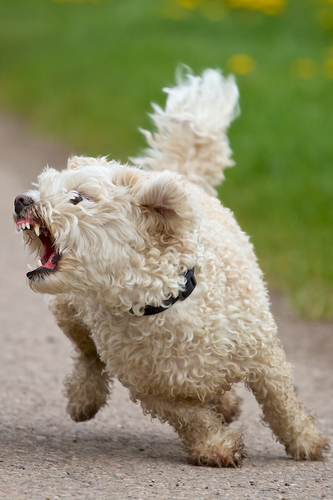 Stop puppy biting when your dog is young, to prevent aggressive behavior, dog bite injuries and even law suits when your Bichon Frise dog is an adult. 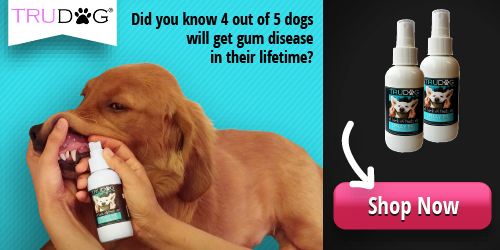 Biting dogs cause injury to nearly 800,000 people annually. And because of that, some homeowner insurance companies are now requiring that dog owners of aggressive dog breeds take out a separate policy for their dogs. While puppy biting and chewing is cute when your Bichon Frise is little, adult dog biting, can get both you and your dog into serious trouble. Belgian shepherd puppy biting and pulling his owner’s pants leg. Working with your Bichon Frise puppy early can prevent problems with aggression later. How Does Puppy Biting Get Started? Your Bichon Frise is a very playful, social pup, by nature. And puppies explore their new world with their mouths. Like all dogs at young ages, Bichons are prone to playful biting and chewing when they are teething. Innocent nipping and chewing turns into people biting when a pet owner does not correct puppy nipping and mouthing. Puppies must be trained to understand, that, under no circumstances, is it OK to bite a human. In addition to redirecting your puppy, make sure your Bichon Frise gets some exercise every day. Getting rid of excess energy will cut down on compulsive behaviors like nipping and chewing. A half hour of walking every night and every morning is a good starting point. This burns off excess energy, that can lead to nipping and other unwanted behaviors. Obviously you need to nip puppy biting in the bud, before it becomes a major issue. The video that follows is part of a webinar that was given by Doggie Dan. He discusses how to stop mouthing and biting when your puppy is still young. Key to Doggie Dan’s method of training is that YOU need to take charge and become the Pack Leader. When your dog understands who is in charge, she is more than happy to comply with your wishes. This is not hard to do, if you keep in mind that you are teaching your dog how to act, much like his mother would teach him. A second approach focuses on the Bichon Frises’ interactive personality. Bichons are quite social. They want you to socialize with them, in return. When your puppy nips you, you can distract him with a toy or other object that he is allowed to chew. But this time turn your face away from your puppy. Do not give your puppy eye contact. Immediately distract him and give your dog a toy. Praise him for playing with his toy. This conveys the message that it is OK to chew on toys, but not people things, or people. 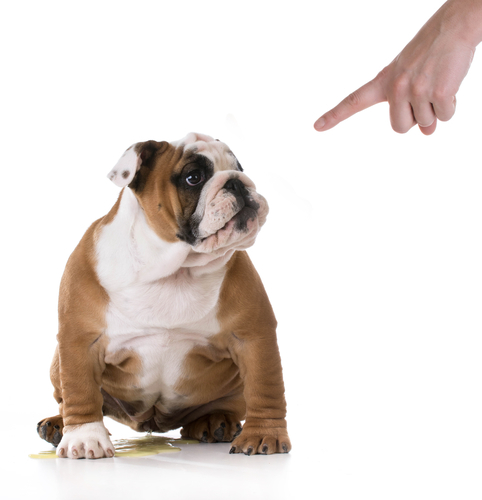 Your puppy may continue to try nipping you, and if she does, continue to ignore her. Over several days of using this training method your Bichon will realize that nipping means that pack members will not socialize with her. That’s no fun! Bichon Frises crave your approval, so this often works very quickly. As you continue your efforts to stop puppy biting, please remember that biting and nipping are perfectly normal pack behavior for a Bichon Frise puppy. At this age it’s not aggression, but rather a learning process. Since you are now the head of your Bichon’s pack, you must lead the way toward healthy interactions, and build a respectful, loving relationship between yourself and your dog. You are teaching your dog proper behavior. Puppy training is easy when you know how to do it. 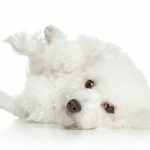 Learn about how to work with a sensitive Bichon Frise here and learn how to make sure your puppy doesn’t turn into a monster adult dog that people are afraid to be around. Keep in mind that correcting bad dog habits early, will help you train your puppy to be a happy adult, that people enjoy seeing! Would you like to see more articles on dog behavior problems?